The EPA-registered and FDA-compliant antimicrobial additive used in Prevenz™ wheels is designed to suppress the growth of a variety of destructive and odor-causing microbes, including bacteria, molds, mildew and fungi. 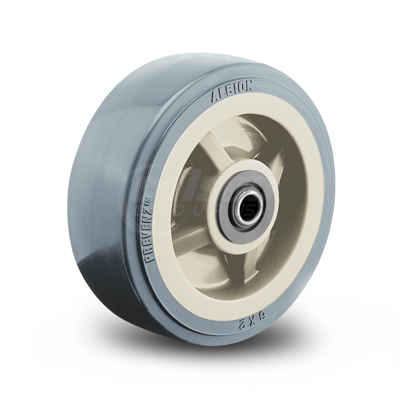 These wheels are suitable for a variety of applications, including medical equipment, food equipment, pharmaceutical, chemical, meat and poultry processing plants, and more. The antimicrobial compound used in Prevenz™ wheels is designed to suppress the growth of a variety of destructive and odor-causing microbes including bacteria, molds, mildew, and fungi. The active ingredients neutralize the ability of microbes to function, grow and reproduce. Prevenz™ is engineered o be effective against microbes for the life of the wheel. The agent remains stored in the polymer and is gradually released to the surface of the wheel. Will scratches, tread wear or wax buildup diminish the effectiveness? No. Prevenz™ protection is not a coating on the surface of the wheel. It is an integral part of the wheel material. Abrasion, chips or scratches will not impact the effectiveness of Prevenz™ in any way. Not even wax buildup on the wheel can impair the bacteria fighting performance. Does Prevenz™ eliminate the need for cleaning? No. Although Prevenz™ provides an added level of protection, these wheels do not eliminate the need for normal cleaning practices. They are designed to work in conjunction with and enhance your ongoing program. Good hygiene practices should always be observed. Yes. The active ingredients in Prevenz™ have undergone extensive laboratory testing and have been proven safe. The active ingredient has a history of hospital use for more than 30 years and is used in a broad range of popular personal care products, such as antimicrobial soaps, toothpastes, and deodorants. It is registered with the US Environmental Protection Agency (EPA), and products with this material have been approved by the US Food & Drug Administration (FDA), the European Union (EU), the National Sanitation Foundation (NSF) and other regulatory authorities around the world. For the best protection against corrosion and destructive microbes.